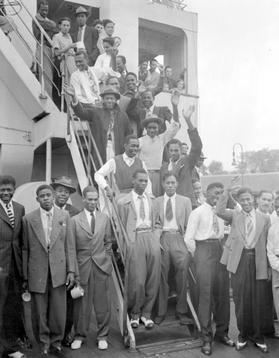 First and foremost, the vast majority of Caribbean nations have a significant diaspora, mostly in Britain as they are former British colonies but also elsewhere (for those readers unaware of this word’s meaning, the official definition is: ‘the dispersion or spread of any people from their original homeland’). In some countries past emigration patterns are stronger than others, like Jamaica for example, as post World War ll saw hundreds of thousands of Jamaicans move to Britain for work purposes. People then settled and had family so today the British Jamaican diaspora is one of the largest on the planet. This helps explain why the Jamaican national football team is one of the leading programmes when it comes to tapping into the diaspora, because there is such a big proportion of British footballers who are eligible for this country through their heritage. Now, logic would suggest if the talent and quality is there in abundance overseas, wouldn’t it be foolish not to capitalize on it? It is a fact that football in the Caribbean – while growing – is not on the same level as football in a lot of other places such as the United Kingdom. It is argued that the experience, skill and professionalism that a player from the diaspora can bring is invaluable. For Jamaica’s ‘Hex’ 2014 World Cup qualifying campaign, played from February to October last year, they used 12 players from the diaspora, including German-born Daniel Gordon (by used, they actually appeared on the pitch at some stage). The others who made up the matchday squads were homegrown as boss Winfried Schäfer persuaded the likes of Wes Morgan, Garath McCleary and Marvin Elliot to join up and combine with them. For recent summer friendlies against Serbia, Swizterland, Egypt and France, Jamaica called upon the services of players from the diaspora once more. And with the more friendlies, the Caribbean Cup, Gold Cup and Copa America to come, they seem set on continuing to do so (Jason Puncheon could well become the latest British-born player to arrive according to rumours). Rewinding to 1998, when the Reggae Boyz qualified for their first ever World Cup finals, then-coach René Simões, of Brazil, deemed it necessary to search the diaspora in order to boost his squad for the tournament’s qualifying and the event itself. In came Robbie Earle, Paul Hall, Deon Burton, Frank Sinclair, Darryl Powell, Marcus Gayle and Fitzroy Simpson – all born and bred in England and playing for top level clubs at the time. Earle scored the country’s first ever goal at the World Cup in the opener versus Croatia. 16 years later and Jamaica are still applying the same method. This has been happening for a long while and the fact that a player can represent the country he is born in at youth level, plus in friendlies at senior level, yet appear for the country of their heritage, helps enormously. A lot of players from the diaspora are tested with their country of birth at youth level (U16/18/20/21), aren’t good enough, and then find another way of playing on the international stage. This is a really important reason in explaining why so many players from the diaspora leap at the chance of running out for their adopted country: a sense of belonging. They feel like they are wanted and it is a great opportunity to earn caps, play in tournaments, sometimes even participate at a World Cup (like the English core for Jamaica in ’98). So a pro is that teams often get hungry, excited players with a point to prove after being turned away previously. They might not be good enough for England, or United States, or Germany, but they’re certainly of the required standard for their adopted nation. There is evidence to suggest having players from the diaspora in your squad increases the likelihood of earning results and making progress. Let’s take Antigua & Barbuda, a twin-island of under 100,000 people. They reached the lofty heights of 2014 World Cup third round qualification and for it they brought in a number of players from the diaspora, born in England. In June two years ago, they made the trip of a lifetime when they visited the Raymond James Stadium to play the United States in front of over 20,000 spectators. For this segment of qualifying, then-manager and Englishman Tom Curtis decided to call upon the well-known names of Marvin McCoy, Keiran Murtagh, Dexter Blackstock, Mikele Leigertwood and Joshua Parker, who was profiled on the site back in October. Antigua faced the US on two occasions and managed to score twice, one goal via Oxford-born Blackstock, which was a brilliant achievement. There is a sense that by bringing in these players from the diaspora to complement the homegrown contingent such as the prolific striker Peter Byers, Antigua earned a greater degree of respect and credit. More fans in England took an interest as players from their clubs were flying off for international duty. For smaller Caribbean nations, having the luxury of a player from the diaspora can be priceless. Jason Roberts was born in Park Royal, London to a Grenadian mother and father from French Guiana. Having retired in March this year, he donned he shirt of 10 clubs during a 19-year career. So as you can imagine, when Roberts agreed to pledge his international future to Grenada, known as the “Island of Spice”, they were absolutely delighted. Although Grenada didn’t play lots and lots of matches during his time as an international, he did play prominent roles in ultimately unsuccessful qualification campaigns for both the 2006 and 2010 World Cups. But in this particular case it was more about the effect Roberts had off the pitch with his dedication to helping Grenada through the Jason Roberts Foundation. This was created in 2007 and is still running, giving sporting opportunities to children in the UK and Grenada. Anguilla has a tiny population and football isn’t massively played or covered on the island. But the country has a 2,000 odd diaspora in Slough, England and the team has called upon players from English semi-professional teams in the area in the past. In 2008, The Guardian compiled a piece on the Anguillan British diaspora and highlighted the impact of the likes of Rommel Gumbs, Emerston Brooks-Meade and James Williams-Richardson in qualifying for the 2010 World Cup in South Africa. Although Anguilla did not qualify and are very lowly ranked in the region, they were still able to flex their muscle in this particular market and enhance their squad. For all the potential benefits of Caribbean countries using the diaspora, there are some drawbacks. Firstly, it is argued that by hiring players from overseas, it can stunt the growth of homegrown talent and prevent the development of youngsters. Guyana President, Christoper Matthias, recently referred to overseas-born players who have represented Guyana as “foreigners” and believes they are damaging Guyanese football. Matthias wants to focus on the younger aspects of the national football programme by spending money and resources on the U-17 and U-20 teams. He wants to replicate the Germany model. Some people are on his side, albeit not very many, and others strongly object by saying Guyana should assemble their best possible squad (which would inevitably involve some of the diaspora in England, United States and Canada). But it looks as if this won’t happen and as long as Matthias is in charge, the diaspora will be ignored and the younger, homegrown players will be prioritised. There have been rumours bandied about before concerning homegrown and overseas players in national squads. Sometimes cultures can be different, language barriers can be confusing, even jealously can creep in. When you’re a homegrown player who plays in the domestic division of that country, possibly earning modest wages, and a big player from the diaspora comes along, who possibly earns more money and has a reputation, understandably that can frustrate people. While the homegrown player and overseas player may look the same in terms of appearance, they’re coming from different backgrounds and areas, massively different sometimes. Creating a harmonious atmosphere for the squad can be a major task for a national manager. Another negative is that players from the diaspora cannot always make fixtures because they’re playing with their clubs in the middle of a season and can’t be released. For homegrown players this usually isn’t an issue as the national fixture dates are arranged around the country’s domestic season dates. A prime example is Boyce, mentioned earlier on in this article, who has played four times for Barbados since 2008, which is indicative of his availability because he plays in England with Wigan Athletic. Having looked at the pros and cons, I think Caribbean nations should, if they have the chance, try and use the diaspora at their disposal. In my opinion all nations should build their best possible squads which would increase the competition in the region and we’d see more teams qualifying for CONCACAF events. The senior team is the most important of any country and brings in the most TV revenue, so this money could then be spent on improving infrastructure, facilities and the grassroots.